I somehow like the combination of beef and carrots, the sweetness of the carrots blends quite well with the beef nutty taste, not that I am a big fan of beef nor any other meats but I don’t want to limit myself to cook only vegetarian food. I could but I like variety. 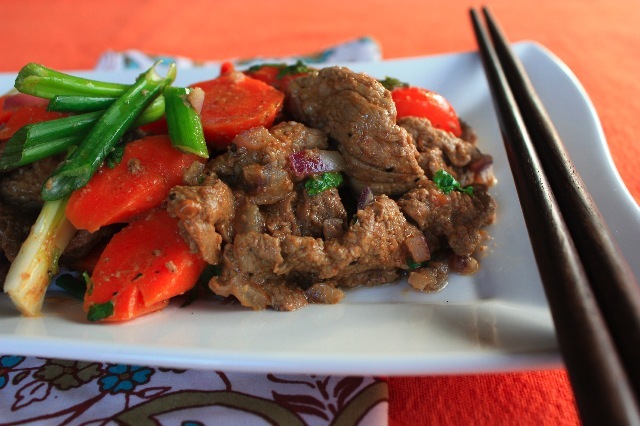 This beef has been marinated overnight with many spices and it’s now sauteed with carrots. You could use green beans as well, or any other vegetable that can remain crunchy. I used a wok for the preparation and it’s the perfect utensil if you want to saute strips of meat, it cooks quickly without drying it and keeps its moisture. Those beef strips remained so tender, they are melting in your mouth. You can serve this dish with sesame rice noodles or coconut rice. 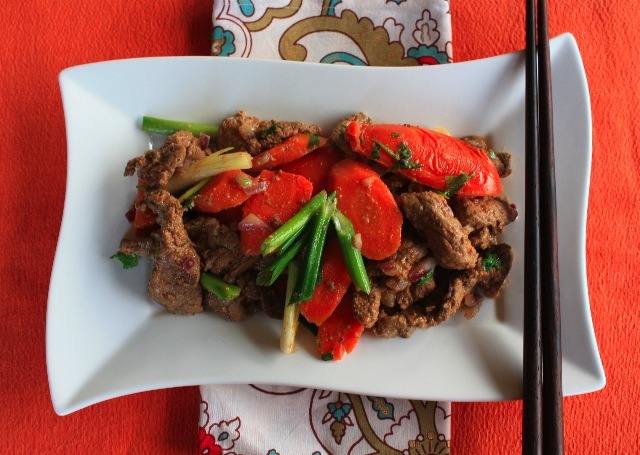 Cut beef in thin strips, place in a container with all the spices, onion, salt and pepper. Place in the refrigerator and marinate overnight or at east for 4 hours. In a wok, heat some olive oil, and saute carrots and tomatoes. Mix well and set aside. Do not overcook the tomatoes, or they will get mushy. Saute beef in small quantities in wok, adding a little olive oil if necessary. Add carrots, mix well and saute for a few more minutes. Add cilantro, and scallions at the end. Stir a little more and serve hot. This entry was posted by silvia on May 26, 2009 at 5:52 pm, and is filed under Meat. Follow any responses to this post through RSS 2.0.You can leave a response or trackback from your own site.